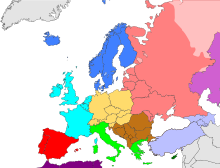 Historically, when Europe was dominated by the Roman Empire, everything not near the Mediterranean region was termed Northern Europe[ citation needed], including southern Germany, all of the Low Countries, and Austria. This meaning is still used today in some contexts, for example, discussions of the Northern Renaissance. Nations usually included within this region are[ citation needed] Denmark, Estonia, the Faroe Islands, Finland, Iceland, Latvia, Lithuania, Norway and Sweden, and less often the United Kingdom (especially Scotland), the Republic of Ireland, northern Germany, northern Belarus and northwest Russia. The entire region's climate is at least mildly affected by the Gulf Stream. From the west climates vary from maritime and maritime subarctic climates. In the north and central climates are generally subarctic or Arctic and to the east climates are mostly subarctic and temperate/ continental.